At the beginning of each year, Lake Superior State University (LSSU) publishes its Banished Words List consisting of English words as well as phrases that have been deemed overused and abused and thus need to be banished from the current consciousness. LSSU began this Banished Words List in 1976 and it continues to this day. For the 2012 edition, some of the words that made it to the notorious list are amazing (which made the top of the list), baby bump, ginormous, man cave and occupy. On the flip side, another American university has, this time, come to the defense of some English language words. Theirs is a list of words not for banishment but for revival. Wayne State University has come up with its own word list consisting of words that they believe should be once again, part of the communication process. Instead of banishing words to oblivion, WSU is all for reviving English language words and giving these words the chance to prove their worth and reason for being. A group within WSU called Word Warriors has made it their calling to give deserving words a chance for glory once again. Michigan is the home state of Wayne State University. The main campus sits on over 200 acres of land and is located right in Midtown Detroit. Aside from the 100 buildings located in the main campus, WSU has several extension centers in Southeast Michigan. At present, there are roughly 32,000 students who call WSU their school. All the U.S. states are represented by students in WSU. Plus, a number of students hail from countries (more than 60 as of last count) beyond the borders of the U.S. Many may not know (or take for granted) that the English language is a very rich language. There are over 1 million words in the English language. This means that there is an enormous buffet of words and phrases to choose from when one wants to express something either orally or in written form. Most of the time, people choose to use words that they often hear or read about instead of using words that really best describe what they want to say. According to one of the originators of the Word Warriors, Dean Jerry Herron of Irvin D. Reid Honors College in WSU, bringing back words that are on the Word Warriors' list allows not only better communication but it will make the world more interesting. The Word Warriors' intention is to promote the use of words that they believe have not been getting enough attention but have so much promise. Some of the words chosen by the Word Warriors have simply been neglected and a few, forgotten. Other words were never given a chance at all even though these words best describe what they were created for. 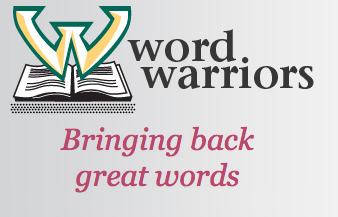 The final list that the Word Warriors publish at the start of each year comes from the Word of the Week, which can be found on their website. The Word Warriors website’s administration chooses the word for the week partly from contributions coming from the general public. Some contributions enter from social networking sites such as Facebook and Twitter. Visitors to the site are enjoined to nominate words as well as vote for words that they think will enliven English communication once again. If you visit the Word Warriors' website, you can find a word list that you can peruse. Examine the list at length and see if you agree or disagree on whether particular words should be revived or note. But even if you don't vote, the mere exposure to these words can surely invigorate your own vocabulary. Frisson: a description for the sudden, often involuntary, shudder of emotion as in a passing feeling of excitement. Below are just some of the words that appeared in the Word Warriors’ annual list since 2010. Find their definitions in your favorite lexicons and see if you want to add them to your personal vocabulary. There are no statistics that can point to whether the efforts of both LSSU and WSU in changing the landscape of English language communication are actually working. However, both universities are shedding light on the fact that communication using the English language can still be greatly improved. Whether or not you agree with each of the words list of these two universities is of no consequence. What is essential is that they have opened the conversation and slowly, people are taking notice of how to improve their own communication style when using the English language. Thank you for sharing! Glad to find this article. Hope to see more articles on the blog.